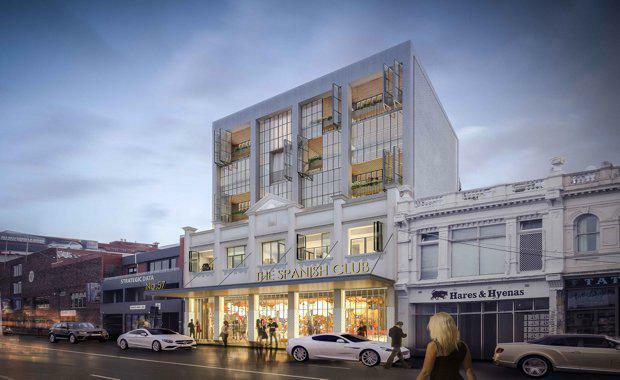 Property development company Gurner have lodged papers with the Supreme Court after a recent VCAT decision denied a planning permit for the redevelopment of Johnston Street’s The Spanish Club. According to Gurner, the intended work included transforming the existing 787 square metre site into a new Spanish bar and restaurant with clubhouse facilities at ground level and apartments occupying the 5 – 6 levels above. However, conflict arose with an adjoining property owner’s automotive paint shop after a failed negotiation to relocate an exhaust flue on the shared boundary. VCAT then issued its rejection of the permit on the grounds that in its current location, the flue was in an unacceptable position for the proposed development, and failed to meet Environmental Protection Authority guidelines and is also a non-conforming use within the current mixed use zoning. The developer and the Club are now taking the case further to appeal VCAT’s decision. Questions have been raised regarding the future of the club, as a proposed agreement between The Spanish Club and Gurner would have seen the developer absorb the club’s current debt to ensure that the banks could not pursue the Club for costs whilst the redevelopment was ongoing. "Unless this decision is overturned we will have to sell up and close the club - without the support of this redevelopment the business model just isn’t viable in its current form," The Spanish Club President Margarita Ros said. Gurner Founder and Director Tim Gurner said he was disappointed to see their permit denied on what he believed to be a 'small technicality'. “We believe the decision was incorrectly made and of a poor judgement," he said. "We will be challenging the decision at the Supreme Court to attempt to keep the Spanish Club alive and thriving into the future. "Established in 1969 along Fitzroy’s effervescent Johnston Street, The Spanish Club was founded by Padre Eduardo Sanchez, the Chaplin to the Spanish, who persuaded the Spanish government to partially assist in purchasing the building to serve as a social centre. The club was originally called The Spanish Roman Catholic Mission, before later being renamed ‘Hogar Español’ meaning Spanish home. The club quickly grew to become a home away from home for hundreds of Spanish immigrants settling in Australia in the late 50s and early 60s, and over the years it evolved to offer extensive social and education opportunities for the Spanish and wider community.